Sure, babies may seem cuddly and forgiving. But a new study shows these little disciplinarians delight in the punishment of those they see as evildoers. According to ScienceDaily, researchers recruited 100 eight-month-old babies, then treated them to puppet shows. Some puppets were mean and some were nice; later, more puppets either took toys away from the mean puppets, or gave them more toys. They then asked the babies to pick their favorite characters — they were more likely to choose puppets who stole from meanies, rather than those who rewarded them. 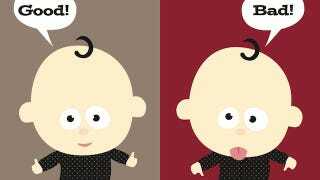 Twenty-one-month-old babies were even more direct — in another experiment, they themselves took treats from mean puppets, while awarding treats to nice ones. Says study author Kiley Hamlin, "We find that, by eight months, babies have developed nuanced views of reciprocity and can conduct these complex social evaluations much earlier than previously thought." She adds, "These findings suggest that, from as early as eight months, we are watching for people who might put us in danger and prefer to see antisocial behavior regulated." Or, babies are just harsh, judgmental jerks who love watching puppets get punished. In fact, instead of adult leaders, we should just have a rotating cast of babies. They'd be tough on crime, and also we could pay them in teething rings and plastic keys.